Firstly we need to download the Starter Kit for a workstation. In the Starter Kit all the necessary configuration file store such as knife.rb and user.pem file. 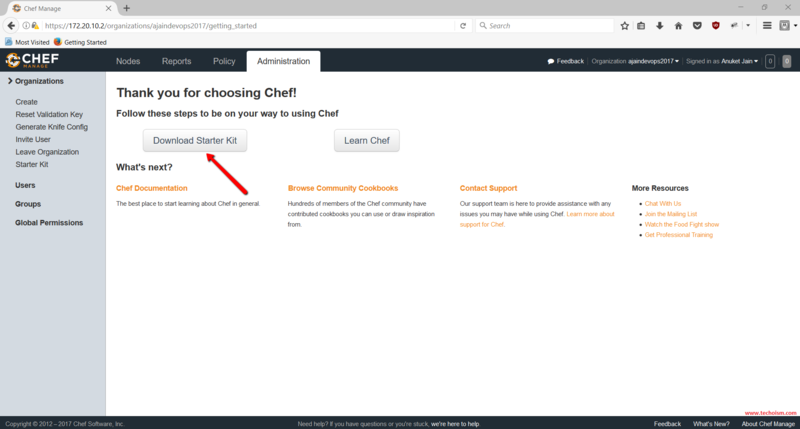 These configuration files help you to interact with the Chef Server. Simply download the Starter Kit and move it to Chef workstation. Choose any of your organization and download the Starter Kit from the Chef Server to our Work Station. After downloading this kit. Move it your Workstation and extract it. This provides you with a default Starter Kit to start up with your Chef server. All the configuration files will store at .chef directory. 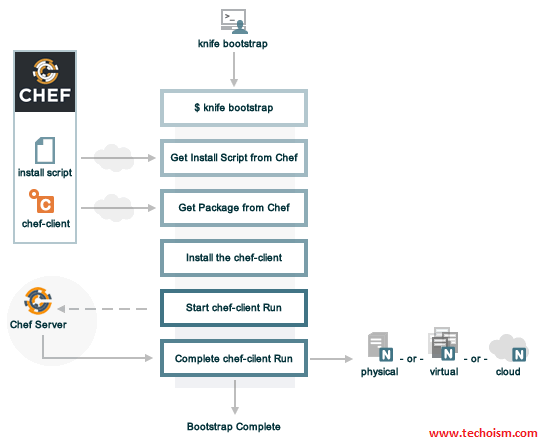 In knife.rb file all the inforation store regarding Chef Server, which help you to connect Chef Server with nodes. Now run below command to verify the connection. Note: After running above command If you get SSL error as below then you need to fetch the SSL certificate for our Chef server. 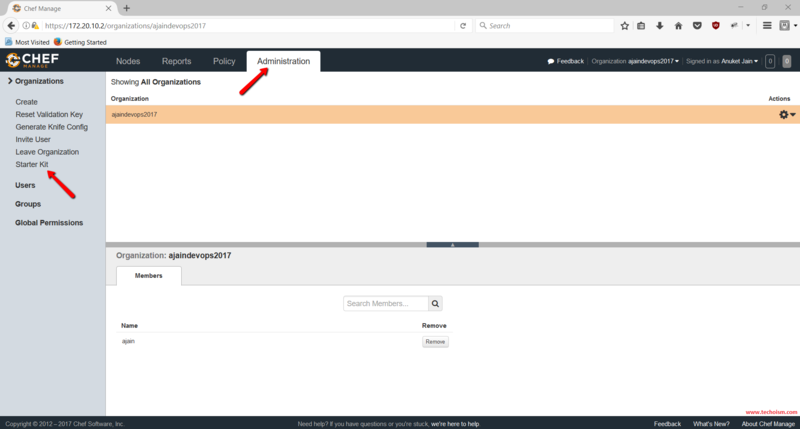 Run below command to fetch the SSL from Chef Server. Knife has no means to verify these are the correct certificates. You should verify the authenticity of these certificates after downloading. SSL certificate will fetch on /opt/chef-repo/.chef/trusted_certs/ location on the server. Run below command to install the Chef Client on the Node. To connect the nodes will Chef Server is very simple. You just need to execute below bootstrape command to connect the node with Chef Server. 172.20.10.12 [2017-08-13T13:38:17+05:30] WARN: Node NodeServer1 has an empty run list. Also, you can verify in the Chef Server web console. In Next article, we will explain who to create a cookbook and run that cookbook on Chef Node. Now you have successfully connected the Node with Chef Server. It’s refreshing to see multiple options when attempting to connect Chef Server with Nodes on Linux. I could see the variety of solutions being helpful tools to any IT person looking to improve their IT productivity. Thank you for the detailed tutorial on connecting Nodes to Chef Servers. I can’t wait to see what you’ll cook up in your next tutorial! Good to hear that you like my article. These days I am a little bit busy so not able to write an article but as soon as I will post an article also, If you required any article then Please let me know.